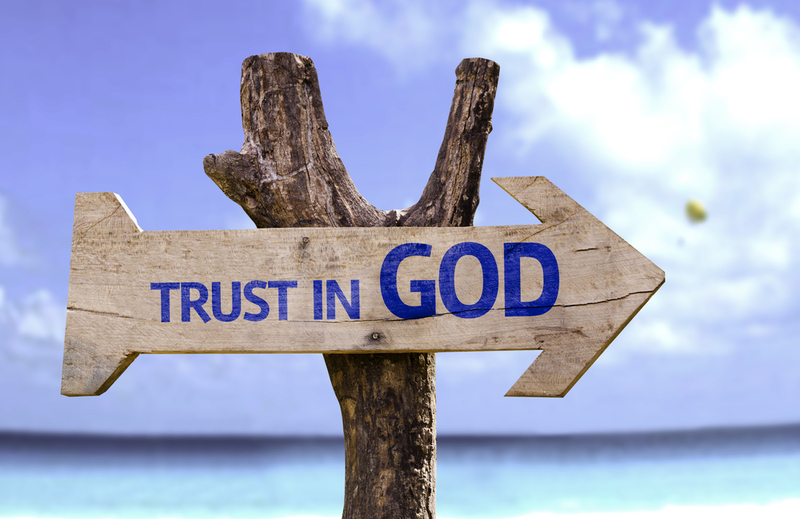 Everyone has heard the phrase “Trust in God!” It is a powerful phrase that is often times used in a way that supposes God is in control of all things. In some circles, it encourages the listener to surrender to the all-powerful God who implicitly can snap His fingers and instantly give us the desires of our hearts and make our circumstances right again. In this common view, God is seen as uber-sovereign and in control of all things (or can control all things and instantly make things happen if He wanted to). But, is that view of trusting God accurate? Is there another way to understand “Trust in God,” keeping in mind God’s uncontrolling love? I think there is. If we are encouraged to “trust in God,” then it is a good question to ask, “What can we trust God for?” If we trust in God, does that mean we will never get into a terrible accident and lose both of our legs? Does that phrase mean we will never die in a horrific bombing? Does that phrase mean we will never be betrayed by a good friend or by an unfaithful partner? Or trust that our children would not be harmed or worse, murdered? Or get cancer and die a painful death? I came to the stark realization that I couldn’t trust God for any of the above things not to happen to me. Why? Because God is not in control of all things. Bad stuff happens, including vicious evil, precisely because God is not in control of all things. What else would we expect in a world where God is not in control? That is right. God is not in control of everything that happens in the world. Today, as we are bombarded with horrific stories and shocking images all day long, the overwhelming evidence of evil creates an enormous amount of cognitive dissonance that demands a verdict: The idea of a Blueprint God, who is sovereignly in control of all things like a Grand Puppet Master, is untenable. Anyone who claims that God is in control of all things is basically stating implicitly that God is the Grand purveyor of evil. Thankfully, that is not the case. The reality is, God’s uncontrolling love defines what God can and cannot do. Because God is love, God doesn’t (can’t) control people or events. Therefore, any of those above events can happen to any one of us, even if we are fully surrendered God-lovers. Therefore, any view that implies God is control of all things and can instantly snap His fingers and change our circumstances or keep us from future pain and suffering if we simply trust him, while comforting, is simply not true. While God is in relationship to all creatures big and small, the only thing that God is in complete control of is God’s self. That is it. Therefore, while God can always be trusted, people cannot always be trusted. Additionally, creatures big and small, laws of regularity, spooky quantum anomalies, etc., cannot always be trusted. Horrific events occur because randomness, lawlike regularities, and human choices collide. So, what is the good news then? Can we trust God? Absofreakinlutely! We can trust that whether we die by a terrorist, have our limbs cut off due to an accident, have our children killed by a sick maniac, get sexually assaulted, or die from a random rock falling off a mountain killing us instantly, that God is always good, loving, and trustworthy. We can trust that while God won’t always give us pristine and pain-free circumstances devoid of suffering and heartache, God’s loving character and commitment to shalom remains constant. We can trust that God is always the smartest, wisest, most loving, and most personable agent in the room at all times. We can trust that God is an expert of healing love, a virtuoso actually, who is moment to moment serenading the universe through his Spirit and captivating those who lend an ear. We can trust that God’s love is trustworthy; it never fails. God is good all the time and all the time God is good. Every moment pulsates with the love of God. If my relative is sick, then I can trust that God is lovingly and compassionately doing the best God can to heal them within an array of vast complexities and agencies. If we need a miracle in my life, we can trust that God loves to show up in creative and unexpected ways while remaining in cooperation with other people and circumstances. Sure, sometimes when we fully trust God and surrender our hearts, amazing things can happen. But, there are no guarantees. The most beautiful gift that can be given when one fully trusts God is that even in the midst of the shitstorms of life, the peace of God, which transcends all understanding, will guard our hearts and our minds in the beauty of who God really is (Phil. 4).